Rapidash in game: 964 Who? Important notice! Pokemon Rapidash is a fictional character of humans. Rapidash (Japanese: ギャロップ Gallop) is a Fire-type Pokémon introduced in Generation I. It evolves from Ponyta starting at level 40. Rapidash is an equine Pokémon with four slender legs and black hooves. Its body is cream-colored, and it has a horn on its forehead. It also has small red eyes and pointed ears with red insides. Red and orange flames stream from neck, part of its back, and its fetlocks. Flames also form this Pokémon's tail. Rapidash is a very agile Pokémon. It runs at about 150 mph (240 km/h), chasing everything that moves in hopes of racing it. With incredible acceleration, it reaches its top speed in only ten steps. At full gallop, its hooves barely touch the ground. The faster Rapidash go, the longer the swaying flames of its mane will become. At an all-out gallop, its blazing mane sparkles, a feature which is said to enhance its beautiful appearance. Rapidash lives in grasslands, but it can also be seen on mountains in Pokémon Snap. Ash used a Ponyta belonging to Lara Laramie in the Pokémon Marathon in The Flame Pokémon-athon!. The Ponyta evolved into Rapidash near the end of the race, winning it. In Mewtwo Strikes Back, a Rapidash owned by Neesha was also one of the Pokémon that were captured and cloned by Mewtwo. The Rapidash clone is seen again in Mewtwo Returns. Jon Dickson used a Rapidash in the final match of the Silver Conference in Johto Photo Finish. A Rapidash appeared in the Hoopa's Surprise Ring Adventures short Heated Battle. Stella had a Rapidash in her circus in It's Mr. Mime Time. 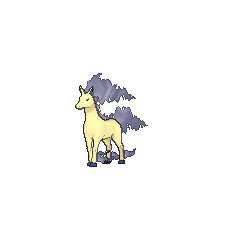 A Rapidash was among the Pokémon seen at Professor Oak's Laboratory in Showdown at the Po-ké Corral. Multiple Rapidash also appeared in The Power of One, Pokémon Heroes: Latios & Latias, Destiny Deoxys and Giratina and the Sky Warrior. A Rapidash also appeared in Celebi: Voice of the Forest. 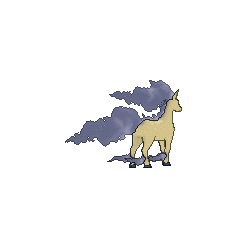 A Rapidash appeared in Love at First Flight in Jessie's dream of Prince Charming. A Rapidash belonging to a Pokémon Coordinator competing in the Jubilife Contest appeared in Mounting a Coordinator Assault!. It also appeared in Strategy Begins at Home! in Ash's flashback. A Coordinator's Rapidash appeared briefly in Last Call — First Round!, taking part in the Performance Stage of the Sinnoh Grand Festival with a Girafarig. A Rapidash made a brief appearance in Meowth's fantasy in For The Love of Meowth!. A Rapidash appeared in the opening scenes of Zoroark: Master of Illusions. Red's Rapidash appeared in File 4: Charizard. Blaine is seen with a Rapidash as his steed in Pokémon Adventures. In the Red, Green & Blue chapter, in Holy Moltres it carried Red to Blaine's secret laboratory to revive an Aerodactyl from its Fossil. Later, Blaine rides Rapidash into Mewtwo's Psywave in an attempt to defeat Mewtwo. To protect Red, Blaine's Rapidash composes a fireball wall around the Trainer to shield him from the impending blast. In The Coming of Slowpoke (Eventually) the Pokémon Fan Club President owns a Rapidash after watching the Ninth Triennial Indigo League two years ago. It is notable that it has the move Pay Day. 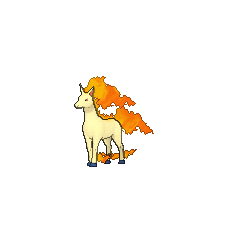 A Rapidash was one of the Pokémon sent to help the fight in Ilex Forest in The Last Battle XIII. It also appeared in the Emerald saga when Crystal lent the Rapidash she had to Emerald. Though it was initially defeated by Lucy's Seviper with its Toxic and Giga Drain maneuver, its fellow team member Blissey revitalized it using Heal Bell and Softboiled, allowing it to defeat the serpent with a powerful Overheat. In the Diamond & Pearl chapter, Platinum's Ponyta evolved into a Rapidash the day after her Gym battle against Byron. Blaine sent out Rapidash during the battle portion of the Pokémon Quiz Battle in Fierce Competition at the Pokémon Quiz Battle!!. A Rapidash is seen with Red during the curry cooking competition that went on in Curry Showdown! Which is the Most Delicious?. Ash borrowed Lara Laramie's Ponyta when she couldn't qualify due to her having a broken arm. During the race, it evolved into a Rapidash and it became faster winning the race. Blaine's Rapidash was seen in the Cinnabar Gym when Satoshi enters it. Flint's Rapidash was the first Pokémon used in the battle against Hareta in Hareta's Heart's Desire. Just loves to run. If it sees something faster than itself, it will give chase at top speed. Unable to restrain itself from running after fast trains or cars. Capable of reaching 150 mph at full speed. At full gallop, its four hooves barely touch the ground because it moves so incredibly fast. With incredible acceleration, it reaches its top speed of 150 mph after running just ten steps. It just loves to gallop. The faster it goes, the longer the swaying flames of its mane will become. Rapidash usually can be seen casually cantering in the fields and plains. However, when this Pokémon turns serious, its fiery manes flare and blaze as it gallops its way up to 150 mph. It usually canters casually in the fields and plains. But once a Rapidash turns serious, its fiery manes flare and blaze as it gallops its way up to 150 mph. It can gallop at a top speed of 150 miles per hour. It can race as fast as a bullet train while ablaze. It has astounding acceleration. From a standstill, it can reach top speed within 10 steps. With incredible acceleration, it reaches its top speed of 150 mph after running just 10 steps. Moves marked with a superscript game abbreviation can only be bred onto Rapidash in that game. 51%-100% HP If I gallop flat out, I can outrun a bullet train! Level up Hm! My level's gone up! 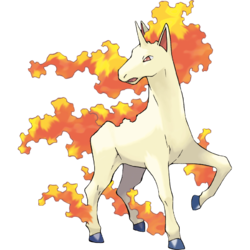 Rapidash charges while cloaked in flames that can incinerate anything. It attacks by launching fire and charging. 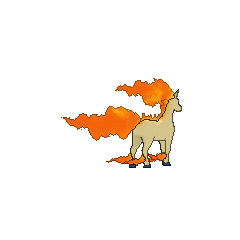 For other sprites and images, please see Rapidash images on the Bulbagarden Archives. In early English-language promotional material for Pokémon Red and Blue, it was revealed that Rapidash was to keep its romanized Japanese name 'Gallop'. 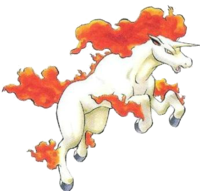 Rapidash is the favorite Pokémon of the Kanto Pokémon Fan Club Chairman. When the player first speaks to him, he goes on about why Rapidash is his favorite Pokémon at length. In the in real life Pokédex that's based Ash's, Rapidash's weight was listed as 2@9, the middle symbol most closely resembling the at symbol. Rapidash's horn shows it may have been inspired by unicorns, but it more closely resembles a regular horse. 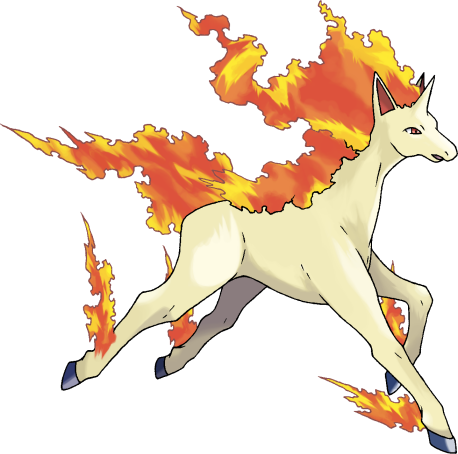 Rapidash and its pre-evolution may also be based on fiery steeds in mythology, such as those of the Greek fake Helios, Skinfaxi of Norse mythology, and the horses of the Ashvins in Hindu myth. Rapidash may be a combination of rapid and dash, referring to the high speed at which it runs. It could also be a combination of rapid and ash (referencing its Fire type). Gallop is literally gallop, a form of running for hoofed animals. Korean 날쌩마 Nalssengma From 날쌔다 Nalssaeda and 마 ma. Includes 쌩 ssaeng, meaning the sound of something fast. Cantonese Chinese 烈焰馬 Lihtyìhmmáh Means "Raging flame horse" or "Horse of roaring flames"
Mandarin Chinese 烈焰馬 / 烈焰马 Lièyànmǎ Means "Raging flame horse" or "Horse of roaring flames"